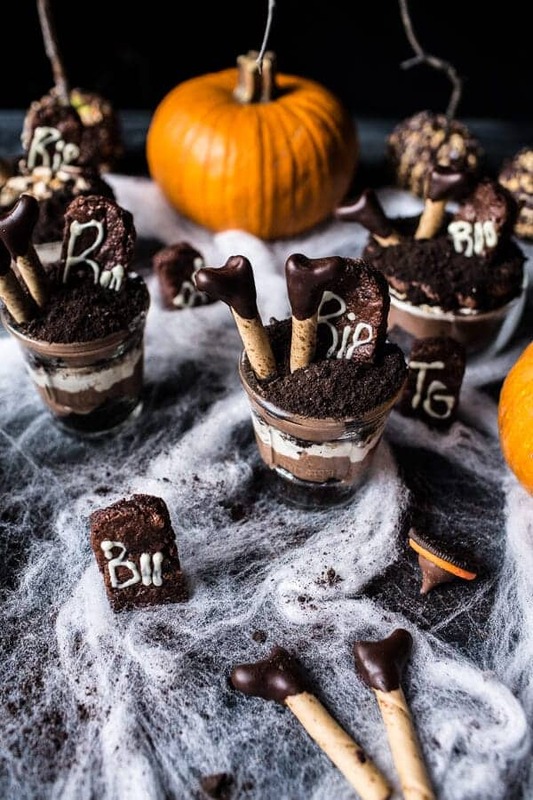 Deathly Chocolate Graveyard Cakes…Witches Beware. 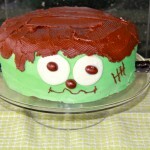 He did the Mash, he did the Monster Mash…. The Monster Mash, it was a graveyard smash. Sorry, sorry, I had to. It’s just so fun! And it’s Friday… and my brain is a little FRIED. 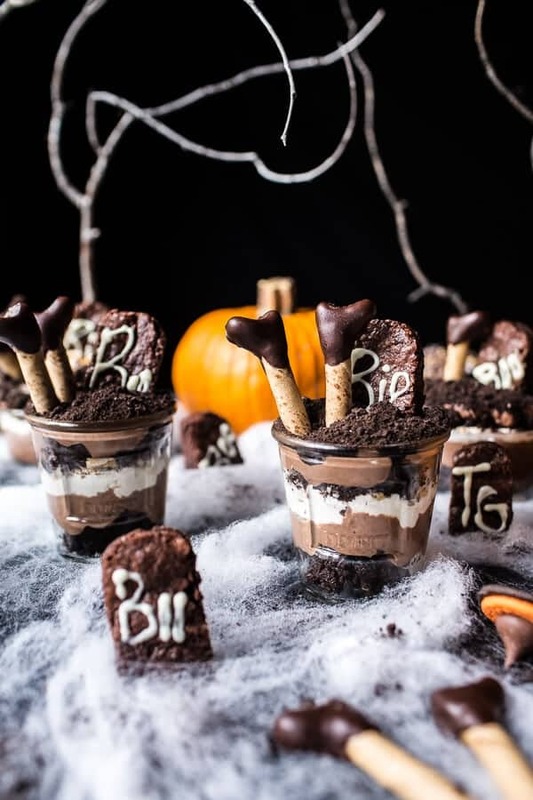 And um aren’t these deathly chocolate graveyard cakes the cutest?!? I am in love with them! Bring on Halloween cause I am so ready! Here’s the deal, when it comes to decorating desserts, I just can’t do anything fancy. Meaning royal icing, fondant and all the fancy stuff is just so not for me. Don’t get me wrong, I SO want to be talented enough to work with that stuff, but I have tried, and every time it ends in tears. I figure one, I just don’t have the steady hands and two (and probably most important), I just don’t have the patience. Thing is, when the holidays roll around I have so much love for holiday themed food. They are just so cute and fun and they make me feel like a kid again, which is awesome, since even as a kid I was more like an adult. <–FREAK. Over the years though, I have come up with some ways to make cute decorated food without wanting to pull my hair out in the process. I mean, we’ve all been there, right? Making those cookies you saw on Pinterest that look like the cutest little monsters ever….but yours just look like a green blob? Oh my gosh, that’s me every time. 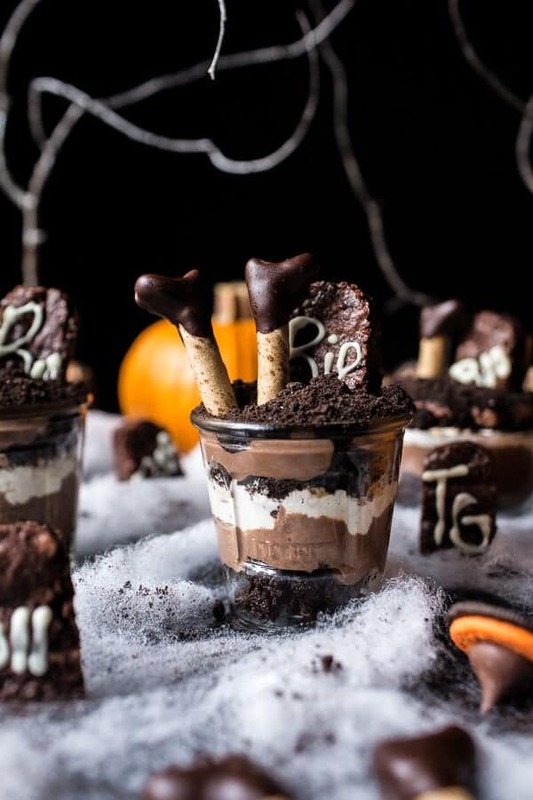 I cannot say these are completely no fuss because, I will not lie, those witches black boots took me a good thirty minutes to form, but as far as cute desserts go, this one is DO-ABLE. I even included one super easy version and another completely homemade version. 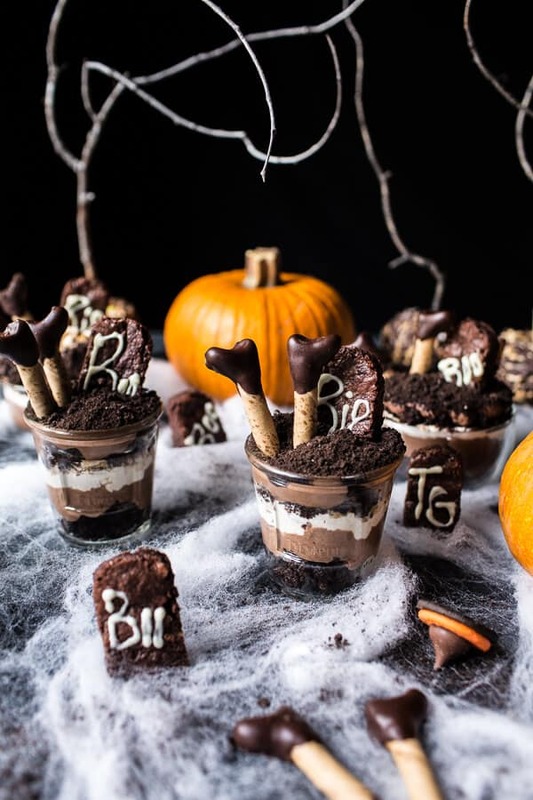 One for peeps who have a little weekend time, and one for peeps who have ZERO time but NEED chocolate and they need it served in a cute, spooky way! Ahh, I love spooky Halloween desserts. The dessert itself is a chocolate lover’s dream. Chocolate cake, chocolate mouse, whipped cream, SNICKERS and then repeat the layers. OH, and the cake may or may not be soaked in Kahlua. Ok, it’s totally soaked in Kahlua… I know, I know! But if you have kids or just don’t want the booze, you can use equal amounts of either salted caramel, butterscotch sauce or sweetened condensed milk. Not a huge deal, but I personally love the Kahlua! Let see, what else. 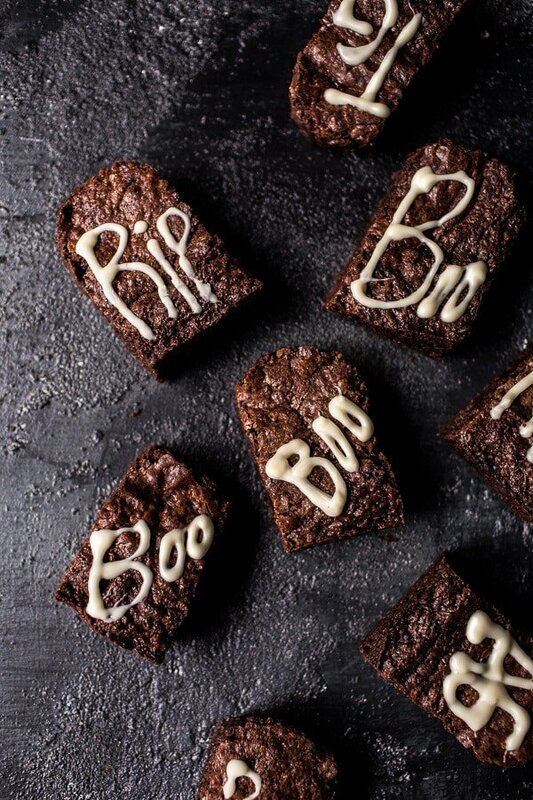 The tombstones are simply made out these brownies with white chocolate for the writing. So simple and so easy, but yet so spooky! Asher still cannot get over these brownie/tombstones. She says they are the spookiest thing ever…but then, she really knows how to butter me up, and she maybe just wanted me to keep allowing her to eat them all. Ugh. That girl. She gets me every time. Really though, do you guys see the chocolate situation happening here right now? It’s AMAZING. The photos kind of say it all for this recipe. But again, Kahlua soaked chocolate cake, chocolate mouse, whipped cream, Snickers and then a whole bunch of crushed up Oreo’s?? Yup. That says MAKE ME. <–Please and THANK YOU. One last thing…Happy 75th Birthday Nonnie, wish I could be there to celebrate with you! 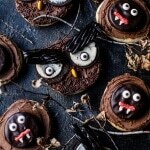 (The Cheaters Way) Deathly Chocolate Graveyard Cakes...Witches Beware. And um aren't these deathly chocolate graveyard cakes the cutest?!? I am in love with them! Bring on Halloween cause I am so ready! Heat oven to 350 degrees F. Grease two 8x8 inch baking pans. Make and bake cake mix as directed on box only divide the batter between 2 (8x8 inch) pyrex pans. Cool 5 minutes. Reserve one cake for another use or freeze for another time. Use a fork to poke the cake all over to aerate and then evenly pour the Kahlua onto the cake. Cover the baking dish and place in the fridge for at least 2 hours, but preferably overnight. Meanwhile, make chocolate mousse as directed on box. Cover and refrigerate until cake is ready. Remove the Snickers from the freezer and finely chop/crush them. Remove all the layers from the fridge. Using a fork, break the cake into crumbs. Divide the cake crumbs evenly among the bottom of six (8 ounce or larger) glass serving dishes. Spread with a layer of chocolate mouse and then a thin layer of whipped cream. Sprinkle the chopped Snickers over the whipped cream. Repeat the layers one more time. For the third time around, end the layers at the chocolate mousse. You may have leftover ingredients depending on the serving dishes you used...use those for snacking! Place the cakes in the fridge while you prepare the decorations. To make the witches legs, place the caramel bits in the microwave and microwave on 30 seconds intervals until the caramels are just soft enough to mold. Roll the caramels into teaspoon size balls and then press the ball onto the end of a Pirouette Rolled Wafer. Do your best to form a rough boot shape by forming the caramel into an L, then make an indent in the bottom of the L to form the heal. Make the sure the caramel is attached to the wafer and then place on a parchment lined baking sheet and repeat with the other wafers. Place the pan in the freezer while you melt the chocolate. Once the witches legs are cold, dip the boots through the chocolate and then place back on the parchment lined baking sheet. Repeat with the remaining legs. Freeze the legs until the chocolate is set. Meanwhile, cut rounded tombstones out of the brownies. Add the melted white chocolate to a small sandwich baggie and snip the corner off. Draw out words like, RIP and BOO or whatever you prefer on the brownies. Let the chocolate set. Remove the top cookie of the halloween Oreos and then press a Hershey's kiss into the center to make a witches hat. Add the remaining chocolate cookies to a bag and finely smash into fine crumbs. Remove the cakes from the fridge and stick in one tombstone brownie and one set of witches legs. Cover the top surface of the cakes with Oreo cookie crumbs. Repeat with the remaining cakes. Return the cakes to the fridge until chilled or ready to serve. When ready to serve, scatter the witches hats around the cakes for a spooky effect. Enjoy! *I prefer using all Kahlua in the cake, however, if you are making this for kids, caramel sauce or sweetened condensed milk are great subs. 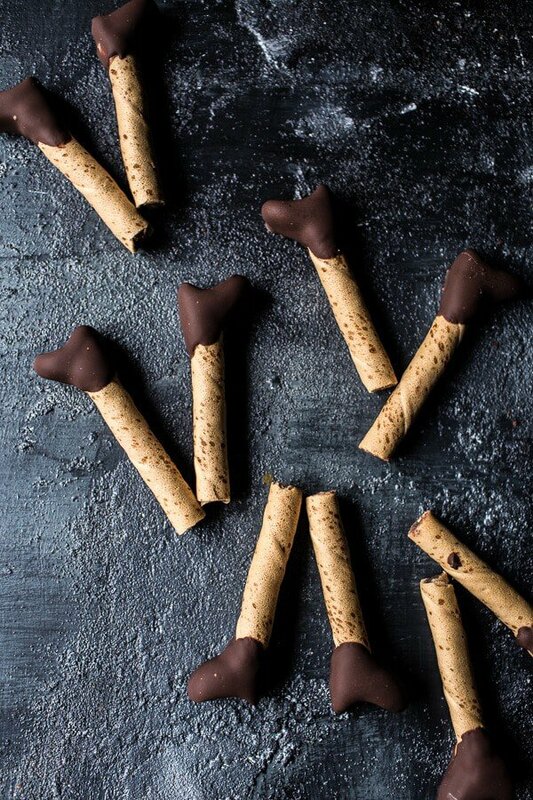 **Witches Legs inspired by [A Spicy Perspective | http://www.aspicyperspective.com/5-easy-halloween-treats-made-with-pirouette-cookies/]. 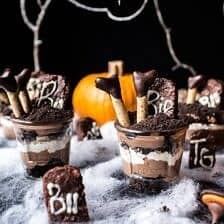 (The Homemade Way) Deathly Chocolate Graveyard Cakes...Witches Beware. 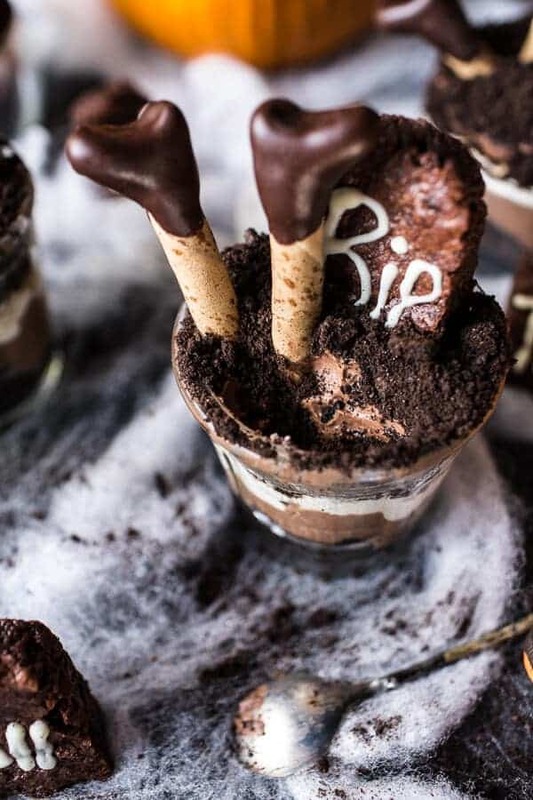 Deathly Chocolate Graveyard Cakes...Witches Beware. Preheat the oven to 350 degrees F. Grease one 8x8 inch pyrex pan with butter or cooking spray. In a medium size bowl combine the flour, sugar, unsweetened cocoa powder, baking soda, baking powder and salt. Set aside. In the bowl of a stand mixer (or use a hand held mixer) beat together the eggs, buttermilk, canola oil and vanilla until smooth. Slowly add the dry ingredients to the wet ingredients with the mixer on low until there are no longer any clumps of flour. Add the hot coffee and mix until combined. Batter should be pourable, but not super thin. Stir in the chocolate chips, if using. Pour the batter into the prepared cake pan and bake 20-25 minutes until the top of the cake no longer jiggles. Remove and allow to cool 5 minutes. Use a fork to poke the cake all over to aerate and then evenly pour the Kahlua onto the cake. Cover the baking dish and place in the fridge for at least 2 hours, but preferably overnight. In a microwave safe bowl add the chocolate. Microwave on 30 second intervals, stirring after each, until melted and smooth. Stir in the melted butter, it will thicken. Set aside to cool. In a small saucepan whisk together the egg yolks, 2 tablespoons water and sugar. Place on the stove over medium heat and stir constantly until the sauce thickens slightly and just coats the back of a spoon, about 2-3 minutes. Make sure to remove the eggs from the stove the minute they begin to thicken. Stir the melted chocolate into the egg mixture until completely smooth. Place in the fridge while you whip the cream. Place the cream in the bowl of a stand mixer (or a large bowl using a hand mixer) and whip cream until stiff peaks form. Add the vanilla, whip until combined. Make sure not to over-beat, or cream will become lumpy and butter-like. Now add half the whipped cream to the cooled chocolate mixture. Gently fold the cream into the chocolate until no streaks remain. Now add the remaining cream and gently fold into the mousse. Cover the bowl and place in the fridge until ready to assemble the cakes. In the bowl of a stand mixer, whip the cream until soft peaks form. Add the vanilla and whip another minute until you have stiff peaks. Cover and place in the fridge until ready to assemble. Now remove all the layer from the fridge. Use a fork to break the cake into crumbs. Divide the cake crumbs evenly among the bottom of six (8 ounce or larger) glass serving dishes. Spread with a layer of chocolate mouse and then a thin layer of whipped cream. Sprinkle the chopped Snickers over the whipped cream. Repeat the layers one more time. 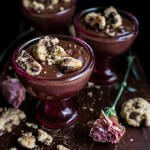 For the third time around, end the layers at the chocolate mousse. You may have leftover ingredients depending on the serving dishes you used...use those for snacking! Place the cakes in the fridge while you prepare the decorations. To make the witches legs, place the caramel bits in the microwave and microwave on 30 second intervals until the caramels are just soft enough to mold. Roll the caramels into teaspoon size balls and then press the ball onto the end of a Pirouette Rolled Wafer. Do your best to form a rough boot shape. Form the caramel into an L and then make an indent in the bottom of the L to form the heal. Make the sure the caramel is attached to the wafer and then place on a parchment lined baking sheet and repeat with the other wafers. Place the pan in the freezer while you melt the chocolate. Quality time in the deathly chocolate graveyard?? Um, yes, I do think so. 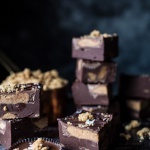 Easy Peanut Butter Cup Fudge with Salted Bourbon Sugar. tried to make melted snowman cookies from pinterest one christmas, and they came out looking like i couldn’t decide what kind of candy to plop on them. these look so much more doable!! the inclusion of both cheaters and homemade versions is great! Oh my gosh, these are the cutest!! I love how you included an easy version as well as a NOT so easy version. I think I’m up for the challenge! Pinning! Woah. These little witches’ legs are SO cute and SO scary at the same time. I’m in love with it, what a great idea ! Oh my goodness! It looks like you and Asher had a blast creating these! I love those witch feet, so adorbs! Pinned! These are too cute! What an awesome idea. I too cannot manage anything super fancy. I took a cake decorating class when I was younger, but Fondant still deeply intimidates me. ? You just made my day. Finally someone that feels my pain about decorating. I see these gorgeous styled cakes and cookies and when I try mine looks like a 5 year old did it. I love that these cups are festive and cute and speaks to my Halloween spirit. This is really a cute idea. These are so amazing, T! Those boots! What a fun and perfectly spooky idea! Happy Fri-YAY! So cute!!! Love the witches boots!! I swear, you deserve an Oscar and an Emmy for your beautiful creations!! So talented!! How cute are these?? SO CUTE Tieghan! I wish my boys were little because they would have loved a setup like this!! Those witches legs are adorable!! Sounds delicious! Thanks for sharing and enjoy the weekend! Oh my gosh. How freaking fun are these?! I definitely need to step up my Halloween recipe game (aka. I don’t have any). What a cute and clever idea! The combination with all the chocolate and Kahlua sounds amazing! And those witches feet…I can’t get over how adorable they are! 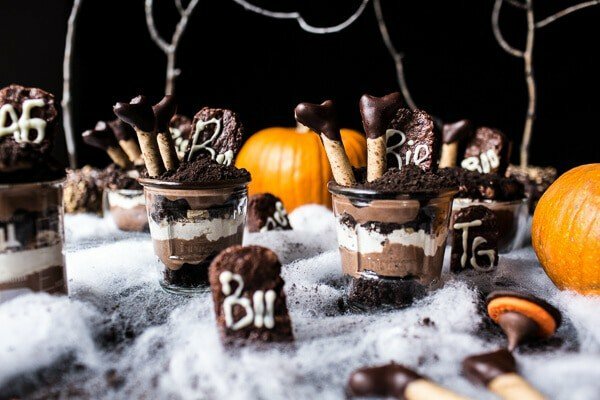 Great Halloween dessert! Love, love, love! Definitely making these for the Halloween party I’m going to this year! So cute! I’m leaning towards the cheaters version…..lol! Happy Halloween! Oh.my.goodness. These are so flippin’ cute! I love it! I get really excited about holiday themed foods too! They are just too fun. I like your combination of Snickers and Kahlua! Woohoo sounds like a Halloween party! These look so amazing and doable! I could totally accomplish this using the cheaters method :D. Thank-you for the recipe! Tieghan, these are the most amazing chocolaty creations. And the photos! Beyond gorgeous (and spooky). Love everything about this post! YESSSSS!!! So ready for Halloween!! How cute are these little cakes!?? You’ve inspired me to start recipe testing this weekend. Seriously though, these are so much fun. p.s. totally LOLing at those witches legs!! Cannot wait for the Halloween treat season to come! Time for banana chocolate ghosts and avocado graveyards! Can I just have all the Kahlua soaked cake, please?! FUN Halloween treat, Tieghan! haha! I know, right?!? Thanks Brenda! I plan on making these this weekend for the kids to eat while we carve pumpkins, but I have a quick question about the directions. In the directions for the cake it says to add Greek yogurt, but the ingredient list doesn’t list Greek yogurt. Do I add Greek yogurt, and if so, how much. Sorry about that, the greek yogurt is a typo. I fixed the recipe so it reads right. Hope you love these and the kids have fun! THANKS!